Navigate: StoreFront / Patterns / Piecemakers Original Patterns / Warm Greetings from Cool Friends NEW! 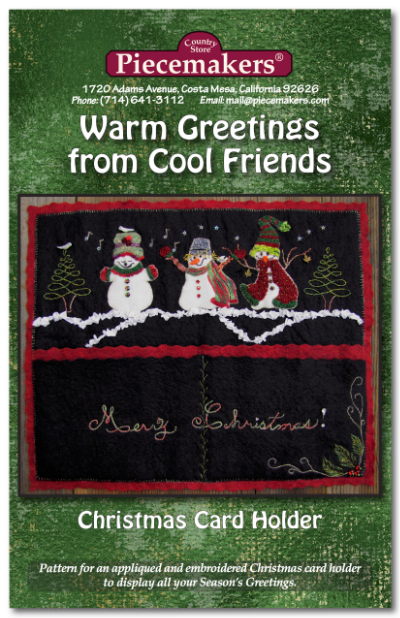 Here is a sweet design for a Christmas card holder that is an embroidery lover's delight. In fact, these little snow people can even stand on their own as a cheery wall hanging to welcome your guests at Christmas time. Using felt for the background makes construction quick and simple, so spruce up your holiday decorations with this cozy applique and embroidery project. -Finished size: 16.5" x 13.5"